SASKATCHEWAN –Denison Mines Corp. and its partners in the Wheeler River uranium joint venture have agreed to spend $10.3 million to advance the project next year. A major undertaking will be to initiate the environmental assessment and engineering studies. The target of this activity will be the Phoenix deposit that is amenable to in situ recovery methods. The decision to advance the project comes after the positive results of a prefeasibility study completed in September. To begin the environmental process, Denison will submit a project description to federal and provincial regulatory authorities in early 2019. Construction could begin in 2022 and first production occur two years later. Environment related expenditures will be $2.5 million next year. The development of in situ recovery (ISR) will make Phoenix one of the world’s lowest cost uranium mines. Benefits of ISR also include the most environmentally friendly mining method. Wellfield tests next year cover the installation of 15 to 20 ISR wells. Denison says the budget for these tests is $2.4 million in 2019. Several other activities are scheduled. A laboratory scale pilot plant will also begin one year of metallurgical testing in the second half of 2019. These tests have a budget of $500,000. Project development and evaluation, including certain third-party reviews, has a $1.7-million budget. The 2019 budget also calls for a $3.2-million exploration program of 13,500 metres in 23 holes. These drill holes will test the potential of the sub-Athabasca unconformity to host other uranium deposits that would support ISR. Wheeler River has an indicated resource of 132.1 million lb. 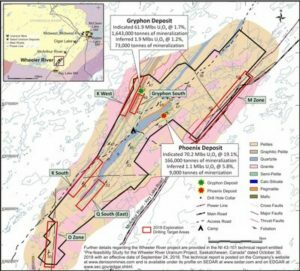 uranium oxide in mineralization grading 3.3%. The inferred resource is 3.0 million lb. at an average grade of 1.7% uranium oxide. Toronto-based Denison holds a 90% interest in the Wheeler River project. Additional information can be found at www.DenisonMines.com.